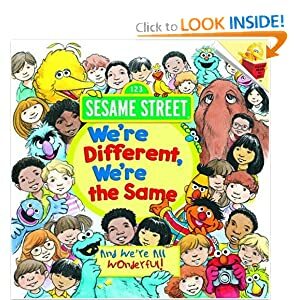 In writing yesterday's post, I kept thinking about the Sesame Street book "We're Different, We're the Same" that was given to K. I think it's one of my favorite books because not only is it fun to read, and the pictures are pretty creative, but it teaches children that it's ok to be different. Just because someone looks or acts differently, they are still human like us. I am in the process of teaching K about skin color. We went to the park a while ago and he played with a black girl there. They got along splendidly! When we got home, he started telling Daddy about the park and says in a puzzled voice, "I played with a alien..."
Sometimes books are the best way to teach a lesson, because kids will often believe it readily. 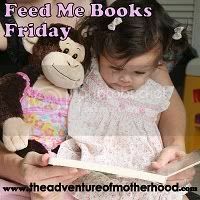 What books have you read that teach children about differences? Would my 3 year old enjoy/understand them? I don't know of any myself but I do agree it's a great way to lay the ground work for new things. When my daughter sees a wheelchair she says bicycle! zoom! zoom! I always let her talk to the person and give them five etc so that she will feel comfortable whenever she sees one.